Sampath has six years of experience in the digital world and is currently a UX designer who specializes in interaction design at HCL technologies. He creates compelling design solutions for Web and mobile applications by applying design-thinking methods. His expertise is in developing solutions by creating user flows and prototypes and conducting usability assessments. The product domains in which he has worked include elearning, enterprise resource planning (ERP), and networking. 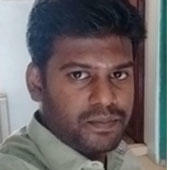 Sampath has always been interested in solving complex problems with pen and pixels. He is a Human Factors International Certified Usability Analyst. Connect with Sampath on LinkedIn.